With the rainy season now underway in Haiti, MSF has seen an increase in the number of cholera patients. Cholera patients recover in MSF's Martissant CTC. With the rainy season now underway in Haiti, Doctors Without Borders/Médecins Sans Frontières (MSF) has seen an increase in the number of cholera patients. Admissions to MSF's treatment centers in Port-au-Prince and Léogâne have more than tripled in less than one month. New patients arrive daily at MSF's cholera treatment centers (CTCs). A woman named Marie was admitted to the Martissant CTC on April 16. "I had diarrhea and was vomiting a lot, then I fainted," she recounted. "A relative brought me here because it is the center closest to where I live. The doctors told me that I had cholera and was dehydrated." One hundred thirty-four other people like Marie arrived at the MSF center in Martissant between April 16 and 23 and nearly 400 more went to MSF's other CTCs in Port-au-Prince and Léogâne. MSF had to reopen a CTC in Carrefour, in the southern part of the capital city, to deal with the new influx of patients and to prevent the centers in Martissant, Delmas and Drouillard—closer to the city center—from being overwhelmed. With all its facilities combined, MSF currently has more than 200 beds in Port-au-Prince and more than 45 in Léogâne dedicated to cholera patients and is prepared to open more sites based on the course of the epidemic. "Cholera is easy to treat but specialized treatment centers must be accessible and patients must be brought there as soon as possible once symptoms appear," says Dr. Sophie Duterne, MSF's medical coordinator in Haiti. "If left untreated, this disease can kill within a few hours. Treatment involves simple oral or intravenous rehydration, with antibiotics for the most severe cases. However, taking additional hygiene precautions and drinking disinfected water is still the best protection." 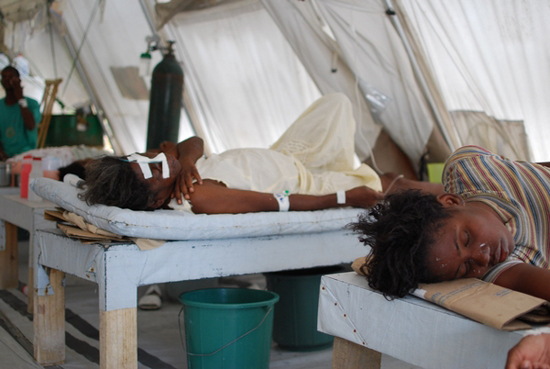 Since the first cases were identified in October 2010, more than 500,000 Haitians have contracted cholera. Inadequate access to disinfected water and insufficient numbers of latrines provide fertile ground for cholera. The arrival of the rainy season further promotes the spread of the disease by flooding water and sanitation systems. "The sewers in my neighborhood are overflowing and we live in unhealthy conditions, without clean water or soap," Marie says. "I knew that I could contract cholera, but I had no choice." Because of this, along with treating patients, MSF continues to encourage Haitian health authorities and its international humanitarian partners to distribute disinfected water and soap and to install and maintain latrines so that Haitians can practice good hygiene and prevent the epidemic from spreading. Since the epidemic began in October 2010, cholera has killed more than 7,000 people (out of approximately 500,000 cases recorded, a number that represents approximately 5 percent of the population). As soon as the first cases were confirmed, MSF set up an unprecedented effort across the country, treating more than 30 percent of the total number of patients on its own.